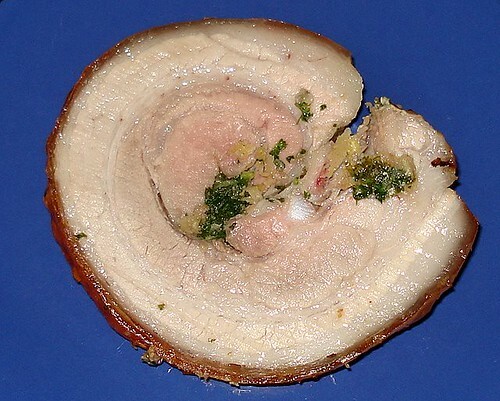 Stuffed pork loin/belly with crackling skin, originally uploaded by Camemberu. I read this recipe in Gordon Ramsay's Kitchen Heaven, which also showed a gorgeous picture. My final product is not as pretty but thankfully it tasted quite quite nice. The sage, parsley and lemon zest infused the meat with a lovely light fragrance. The meat stayed moist and there was no offensive porky flavour. The crackling skin was a treat! Managed to find the recipe online, so you guys can have a go at it too. Suckling pig loin not available in my market, so I used pork belly instead. OOOO...looks so juicy! Luckily it's lunch time now..now where can i find something as good as this for lunch?? Since you're into recipes I thought I'd tell you there is a contest a Writer is throwing. You can win Gordon Ramsay's cookbook. All you need to do is submit a recipe, the winner is randomly picked. Precious pea: hope you found something good!